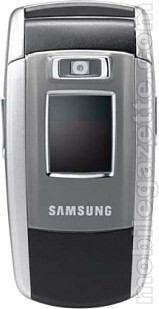 Rumours about the Samsung Z500 have been circulating for a few weeks, with photographs showing a modified E700 series handset with a second camera. These were widely regarded as being complete nonsense, as the view was that it was impossible to fit a 3G handset in a case so small. Well, it turns out that this is exactly what Samsung have done with the Z500. The physical dimensions of the case are 91x45x25mm, making it just a small fraction larger than the E700. Apart from the 3G functionality, the Z500 is very similar to the new E720, with an MP3 player, megapixel camera, Bluetooth and expandable memory. Not only is the SGH-Z500 small, at 95 grams this is the first sub-100 gram 3G phone that we've seen. There's a secondary VGA resolution camera on the inside of the Z500 for making video calls, tucked underneath the Z500's 176x220 pixel TFT display in 262,000 colours. The external display is a 80x64 pixel OLED unit in 65,000 colours. Internal memory is a useful 50Mb, and this is expandable using TransFlash memory cards. The small size of the TransFlash cards helps to keep the size of the Z500 down. Various media playback types are supported, including MP3, AAC, MPEG4 and Real media formats. There's a WAP 2.0 browser and email client built in too, and the SGH-Z500 can be synchronised with a PC to use the handset's built-in PIM functions. In addition to Bluetooth, the Z500 can be connected to a PC with a USB cable or infra-red connection. In addition to 3G support, the Z500 also comes with tri-band GSM (900/1800/1900) and GPRS. The release date is not known at present, but the Samsung Z500 should cause quite a stir when it hits the streets and can be compared against other, bulkier 3G handsets. Although this has a very low key design (unlike the headline grabbing SGH-Z130) we think this is a very significant handset.